Since April 2017, we have been working on the Mill Farm Close Estate with residents to bring more life and colour to the estate and bring out residents’ appetite for gardening. We are pleased to say that we have worked with a number of residents now. Our mini garden makeovers have included introducing hanging baskets, planting in pots, strimming back overgrown grass, tidying paths back - which have all made a difference to individual gardens and the overall estate. We’ve worked with residents who have little knowledge of gardening to others who have lots of knowledge to share and everyone involved has learned lots it’s fair to say! We’ve been in the papers too - having our project story and the difference that’s been made shared with the region! This project has been possible with the funding and support of Karbon Homes, the social housing provider. As one of the biggest social housing providers in the city, the organisation recognises the difference local organisations can make to the local area. The school summer holidays are nearly upon us and we're sure lots are parents are thinking of what to do with the young ones to keep them happy and fed! Well this summer, you're in luck! For the first 4 weeks of the summer holidays, we will be firing up the oven in our community garden in Elswick Park, to bring you fresh hand made pizza for takeaway made by our amazing team of volunteers and staff. Prices start at £3, offering cheese and tomato pizza, with the option of meat toppings, plus soft drinks. Where will we be? Head down the step from the Elswick Road main entrance to Elswick Park. Once you reach the bottom, keep on going until you see us to your left. Big Park Clean Up Success! On Friday 1st June, Elswick Park became a hub of activity, with volunteers, including staff from the Department of Work and Pensions, local residents and an energetic group of young Police Cadets! All came together to support Edible Elswick's initiative to improve the state of the park, tackling overgrown unsightly areas, collecting litter and much needed planting. The steps leading down from the main entrance of the park were seen as a priority and descended upon by volunteers grabbing a tool and getting stuck in! Shovelling, brushing, edging, digging, the volunteers marched on in the hot sun determined to accomplish their task. Once the steps were made to look immaculate (see photo below), next a bed destined to be home to plentiful wild flower plants, to join the West End Wildflower Corridor, run by The Greening Wingrove Bike Garden, supported by Grow Wild, was dug over and attended to by all the group of all ages! Litter picks took place during the course of day, with lots of enthusiastic little ones taking charge looking for left behind wrappers and bottles. Thanks to all our amazing volunteers who made the event such a success, offering Elswick Park the tender loving care it deserves as a beautiful green space, enjoyed by many. Click HERE to read about our event in the Newcastle Chronicle! Yes, spring really is here and we're off! Beginning in mid April, our first Garden Neighbours Project session started off on Mill Farm Close in Elswick. We were helping Nigel, quite a keen gardener already, who has a small decked backyard with lots of planters. Emma and Shiren were joined by another resident who is already joined up to the Garden Neighbours project too, Muamza. With our second session just up the road in Quarry Bank Court, the sessions have been going great, as word has been getting out. Neighbours are starting to get to know one another and as time goes on, we're hopeful that friendships with blossom! The Garden Neighbours Project would not be possible without vital funding from Positive People Positive Places, Karbon Homes and Square One Law. We can't wait to update you more on how the project 'blooms' over the coming months! That's a good question we think. We certainly love making it and eating it, with lashings of butter! With this all in mind, we thought it would be a good idea to see how much bread we could bake in a day and possibly eat in a day! The community were invited along to West End Women and Girls Centre, to enjoy sampling, buy the fresh bread on offer and support the local women who'd been working hard. The smell of the freshly baked bread was a gorgeous smell to be welcomed to. Even better than all our customers enjoyed the bread on offer and went home happy looking forward to their tea. The support was from the local community was amazing to see with much positive feedback. As the day was so successful, the bakery team is excited to share that a regular date will be set to take place once a month. After a summer break, residents got back into the swing of things on the Bentinck Estate shaping up another garden. Resident, Asma, got help with setting up a new composting site, digging up a new bed for flowers and fresh hanging baskets - all adding colour and variety. 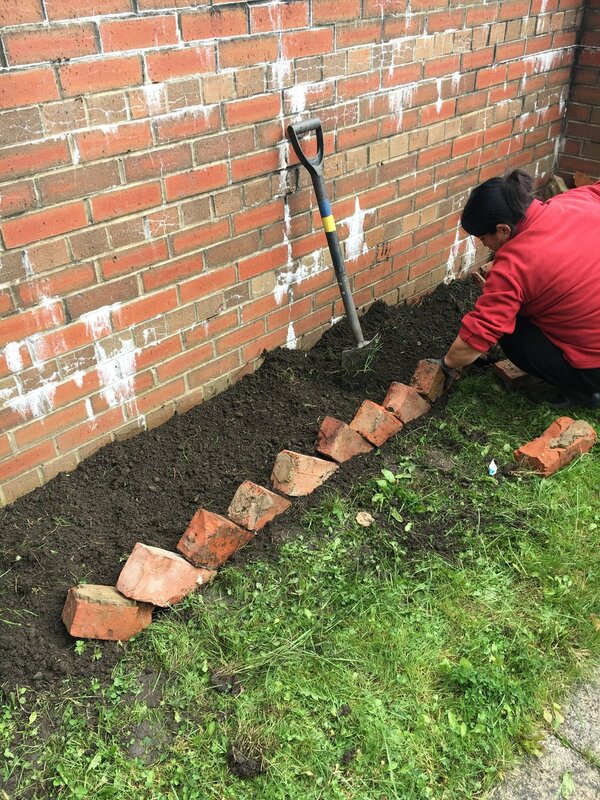 Asma and other residents signed up to the Elswick Garden Neighbours project have been helping other residents with their gardens, and this is the basis on which the project is based - residents giving their time to others and getting the help back in return. We're keeping going over the autumn and into the winter, because a little bit of rain didn't hurt anyone! If you live in either Bentinck or Jubilee Estate or in Elswick, we'd love to hear from you and get you along helping others at our weekly sessions which take place on Monday, 10am-12pm. Get in touch with Emma or Johurun via email hello@edibleelswick.co.uk or call 0191 2734942 to find out more. The sun wasn't quite out on Saturday but that didn't stop local residents coming along to Elswick Park to join in the fun we had in store for them! There was plenty to get stuck in with including willow craft, kite making, face painting, football games, planting and the a great healthy walk around Elswick Park enjoying the surroundings and finding giant fruit shapes dotted around the trail! The cherry on top was our local bakers and makers from the West End Community Bakery who offered freshly made delicious items like samosa, cakes, pies, pakoras and more! We'd like to say shanks to all our partners including HealthWORKS Newcastle with Change 4 Life, Hat-trick, OPAL @ Newcastle University and West End Community Bakery for helping to organise another successful Edible Elswick event!